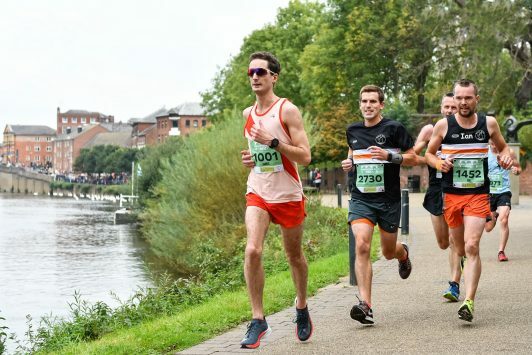 After a heavy block of training through the summer, which saw me hit a record 421 miles for August, it was finally time for one of my key races for this training cycle – the Worcester City 10K. As well as being a fast, relatively flat course with a good standard of faster runners, now I’ve relocated to Worcester the race has the added benefit of starting 800 meters from my front door. Indeed the route runs right past my building, so if things went really pear-shaped I could just step off the course and go home! I headed out for my warm-up a little earlier than usual as my eight-year-old nephew was running his first ever race about 30 minutes before the start of mine. I warmed up along the river, following a fair bit of the 10K route. My legs felt great, as I had tapered fairly aggressively to hopefully ensure I good result. I was chugging along at 7 min/mi very comfortably which was a small confidence booster, although I did wonder if I was going too fast and would regret it for the race. 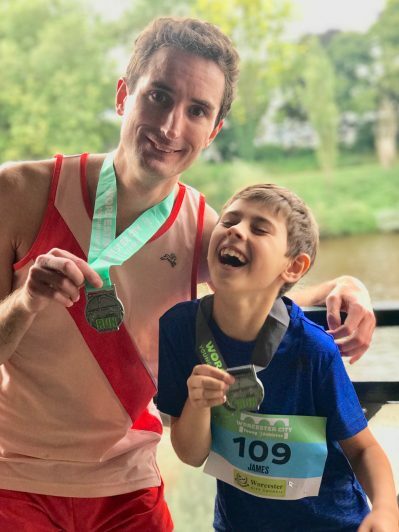 After my warm-up I met up with my family to watch my nephew run his race, and in the excitement I ended up running around to various points of the course to see him and offer encouragement. 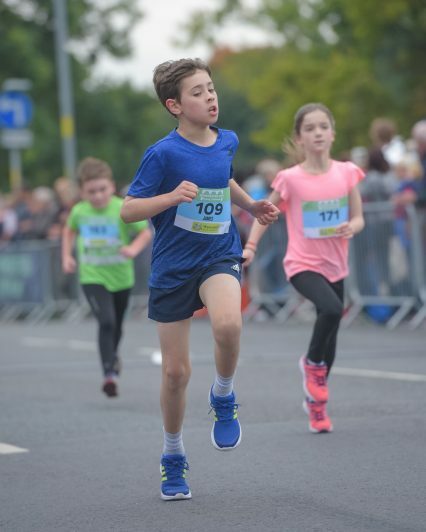 He did fantastically well, running the 1.8 km route in 9:35. Most importantly though, he really enjoyed it and immediately asked to do it again next year. I’ll have to watch it, as before long I won’t be the fastest in the family any more! Suitably amped up by my nephew’s performance, I headed to the start and battled my way through the crowds of runners to ensure I started relatively close to the front. The weather was perfect, overcast and cool with very little breeze to speak of. My training had been going very well, so I knew as long as I put in the effort a PB was on the cards. A precise goal was difficult to settle on as during high mileage training it can be hard to hit the faster paces, but given I managed almost 6 min/mi at a bumpy 5 mile race in poor weather a few weeks previously, I settled on aiming for 37 minute pace which I would then assess once in to the race. The horn sounded and we were off. The first kilometre takes you up over the main river bridge, around a small park, then back over the bridge again. The crowd support around here is amazing, so inevitably I set off a touch fast but concentrated on just keeping the breathing comfortable and trying to find some others to run with. Luckily I fairly quickly settled in with a couple of other guys who were running a pace that felt sustainable. I passed the first kilometre in 3:28, 14 seconds faster than 37 minute pace, but everything felt good so I didn’t panic. The next kilometre takes you up in to the town centre and has a few small climbs, but the legs felt good and I didn’t feel like the inclines were sapping too much pace. After passing 2km (3:36) the guys I was following started pulling away just by a few metres. I made the effort to try and stay with them as I didn’t want to become stranded between groups which is where I can start to struggle mentally. Thankfully I was able to stay with them and we covered km 3 and 4 in a pleasingly consistent 3:38 and 3:38. At this point I began to feel the slightest twinges of a stitch, which I find can happen on cooler days when I’m working hard. I concentrated on breathing full lung-fulls and tried not to allow it to slow me, and thankfully it never developed in to a full-blown stitch. I did slow slightly at this kilometre, running 3:44, however it was also one of the twistier parts of the course, and still being well ahead of target I didn’t panic. It was now just a case of gritting things out. While the pace was definitely getting harder to maintain, I was still feeling pretty good for the later half of a 10K and determined to keep up the good performance. I found myself running with another couple of runners which really helped keep the motivation up, and managed to keep the next few kilometres at a decent 3:39 and 3:42. We now crossed the pedestrian bridge over to the other side of the river for the final two kilometres. This is a path I run almost every day now, so I knew it was nice and flat and I just needed to keep working. Almost hitting the paces I ran intervals at along the same path earlier this year, I hit km 9 in 3:39, leaving one final push for the finish line. I visualised having just 2½ laps left on a track, and tried to slowly crank up the pace. I passed a couple of runners, but another had similar ideas to me and began pulling away. I wasn’t able to keep up, but trying helped keep me going as I eeked out as much pace as I could muster. We crossed the road bridge for the final time and the crowds had grown even louder than when we passed 30 minutes earlier. 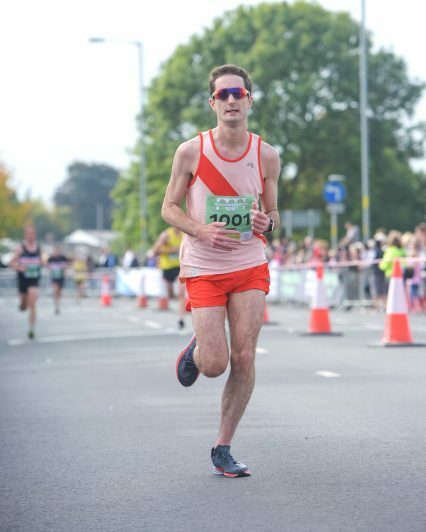 The final stretch is a little bit of a blur as I willed my legs to push me faster, but I remember seeing the time on the finish gantry ticking in the 36:0x range as it dawned on me quite how fast I had been running. I crossed the line and desperately searched for a barrier to support myself as I felt my legs feeling a little weak. But then I glanced down at my watch and saw the time. 36:12! I was pretty speechless with the result. I knew a PB was in me, and hoped sub-37 was doable, but never even considered that I might run low-36. I took 1:35 off my previous PB set in March, and I was over 2 minutes faster than in the same race this time last year. Indeed, two years ago I hadn’t even broken 40 minutes for the 10K. The feeling as I slowly staggered my way through the finish funnel was up there with when I ran 1:45 in my first half, exceeding all expectations, and when I finished my first marathon. Two days later I’m still buzzing – it definitely makes all the hard work feel worth it! I thought the days of taking so much time off a PB in one go might be gone now I’m getting toward the faster end of the spectrum, but clearly my body is still responding very well to the high mileage training I am putting it through. I seem to be lucky in that my body (touch wood!) is able to handle the miles, although I am very careful about keeping recovery and easy runs gentle which I think is a massive factor. Having hated PE at school I had always considered myself to just not be “sporty”, but it just goes to show what a bit of hard work and dedication can achieve. My thoughts now turn to the Oxford Half in three weeks, and the Great South Run two weeks after that. I had previously floated an attempt at a sub-80 half as a sort of pipe dream goal that I realistically didn’t think I’d be in a position to attempt at Oxford. However, the Daniels calculator estimates exactly 79:59 based on a 36:12 10K, so it is now a very realistic possibility and something I am definitely going to aim for. Historically I’ve converted quite well between 10K and half, and with all the miles I’ve done I should certainly have the endurance. The calculator also estimates a sub-60 10 mile time, which has always been a long term goal of mine (although not one I thought I’d be anywhere near for at least a year or two!). It blows my mind it’s a very real possibility I could run such a time. My plan is now to put one final high mileage week of training in, before tapering for two weeks prior to Oxford. I’m then going to take the two weeks between Oxford and the GSR as they come, depending on how I feel after Oxford. I’m also signed up for a couple of 10Ks in November, so obviously thoughts of a potential sub-36 time are very much in my mind.